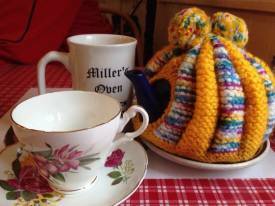 The Miller's Oven began in 1983 as a non-profit tea room managed by a volunteer board, officially named The Rideau Miller's Oven Seniors Committee. In 1984 the building received a Heritage designation from the former Rideau Township. 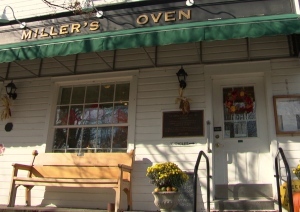 The Miller's Oven has evolved over the years and is a full-service restaurant serving breakfast, lunch and snacks, six days a week. We welcome diners of all ages to join us for wholesome fresh-made food, and friendly conversation if you wish. We encourage any groups, including those from retirement homes, to join us for lunch. We only ask that you reserve in advance so we can get set up for you. The Miller's Oven is managed by volunteer board of directors. Its staff consists of a head cook, kitchen staff, and a corps of volunteers. There are about 50 volunteers in all, mostly seniors and students. The Miller's Oven provides an excellent opportunity for teens to fullfill their volunteer hours requirement, and to gain useful work experience. Volunteers are the heart and soul of the Miller's Oven, which wouldn't exist without them. New volunteers are always encouraged to join us. Please contact the Manager at 613-692-4304 if you are interested. The Miller's Oven has always been a gathering place for locals and visitors alike, a true hub of activity in our community. 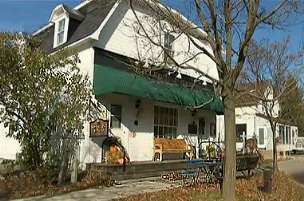 It is located in a heritage building on picturesque Mill Street, in the historic core of Manotick. The Howard E. Henry Building was named for the first Chair of the Rideau Valley Conservation Authority. From 1887-1929 it was the site of Robert Fee's very busy General Store, housing the telegraph office and the village's first telephone. In later years it served as the Oddfellow's Hall, Keith Lindsay's barbershop, and even a public library. In fact the barbershop furniture is now a fixture in the front dining room. The Miller's Oven consists of the main dining room including the open kitchen, and a smaller front dining room on the ground floor. Washrooms are located on the floor, and the dining areas are readily accessible by a ramp. In the summer of 2017 a volunteer-built patio area was added to provide another venue in fair weather. Cyclists are delighted to have a rack for parking their bicycles safely away from traffic.